What happens when a friendship explodes between a temperamental island girl and a practical Delhian guy?... Moments are shared as the sands are passed within the glass,memories are made that the universe keeps secret in its timeless past, hearts don't fall in love, but rather pour la crème glacée, and tropical fires can only be fanned by the night wind's beautiful tune in the silver light of a Delhian moon, that will forever last. Tropical sunsets in Delhian Nights is a beautiful, soulful, emotive collection of poems. To me, these poems embody two auras of different backgrounds that intertwine with each other like peaches and cream. Both body and soul is felt in each of these poems. My favourites thus far are Delhian Friend, Undying Memory, Peut être and A Walk Through Time. 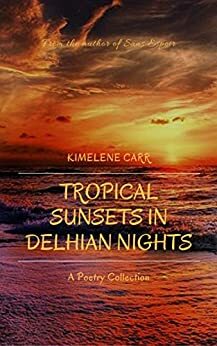 I love Carr’s poetic pieces and her ability to relay the emotions of others so naturally as well, because I know that many of us can relate to these poems. It’s definitely a favourite of mine. Kimelene Carr’s writing is romantic, evocative, and playful all at the same time. Her strategy employed in this book of a sentence or two of prose to set the scene followed by a more extended piece of poetry to get at the emotional core of the subject was unique and felt very fresh to me. The best thing I can say is that I am not a person who really enjoys reading poetry very much, but I loved this. Well done, Ms. Carr.